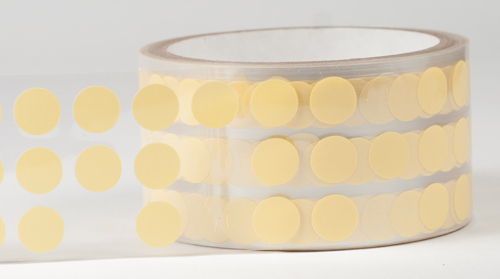 Conformal Coating Discs are made of 1 mil polyester film with 2 mil mustard colored rubber resin adhesive. Many components and printed circuit board locations must remain uncoated and the purpose of the conformal coating masking discs is to prevent migration of the conformal coatings into components. The Conformal Coating Discs offer the perfect solution to ensure areas for use as connector locations or insertion areas for interchangeable devices remain free of the protective coating. They offer high temperature resistance needed in the conformal coating process.. These discs are silicone free, therefore they do not leave any silicone shadow. They can withstand a temperature of up to 325ºF. The objective of conformal coating is to apply a protective layer to the printed circuit board and components to prevent degradation in electrical performance when subjected to environmental stresses encountered in specific operating conditions. Conformal coatings also protect both the printed circuit board and components from airborne or solvent borne contaminants.